I took this shot Sunday just before the fireworks started. 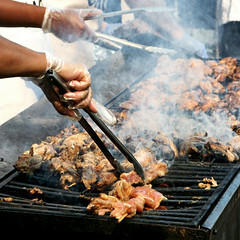 It’s made up of 42 images stitched together. This is really pretty close to how it looked when I was there. The sky was beautiful and the lighting on the bridge was – as always – wonderful. If you’re not familiar with the bridges of Cincinnati (all 7 of them), this is the Roebling Suspension Bridge. It was designed and built by John A. Roebling and is often considered the prototype for the Brooklyn Bridge. You can see that they have some similar styling cues. It’s still in use; in fact, it has recently reopened after an extensive refurbishing. 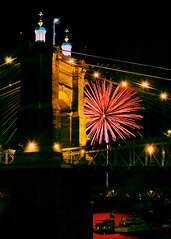 Last night I went out and shot the fireworks for Cincinnati’s All American Birthday Party. I scouted out the location a few hours in advance and picked the perfect spot to shoot from, but it was all for naught because they shot the fireworks from a different spot than usual. I had to think on my feet and make a quick move because the fireworks ended up directly behind the bridge support. I was surprised at how few people were there last night. I’m used to the atmosphere from the WEBN Labor Day fireworks, where there’s not a single unoccupied stretch of land or water for miles up and down the river. Last night I saw probably 15 or 20 people on the Covington side of the river, and the Sawyer Point area didn’t look too much busier. Too bad, because they missed a great show! I also took a few shots to create a sunset panorama (or two), but it’ll take me a few days to process those shots. I’ll post them once they’re done. 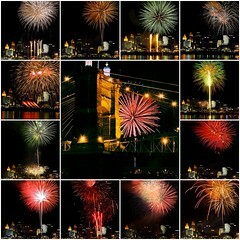 Last night we went down to Devou Park to shoot the fireworks after the Reds game. Unfortunately that put us in line with the fireworks, so they all look like they went straight up in the same spot. Oh well, it was a lot of fun. I’ve never had an accent to speak of, so I hold onto the South’s little colloquialisms like “y’all,” “fixin’ to” and “Coke” as one last bit of rebelliousness against the Northern culture. I find that the longer I’m here, though, the more those things slip away; and that seemingly little thing has been one of the hardest parts of making the move up here. If you’re from Ohio and you’re like me, you’ve probably had it drilled into your head that U-Turns are illegal in the state of Ohio. They say they’re legal in Kentucky and Indiana, but not Ohio. This is simply not true. 4511.37 Turning in roadway prohibited – exceptions. (A) Except as provided in division (B) of this section, no vehicle shall be turned so as to proceed in the opposite direction upon any curve, or upon the approach to or near the crest of a grade, if the vehicle cannot be seen within five hundred feet by the driver of any other vehicle approaching from either direction. Again, making a U-Turn seems to be a perfectly legal maneuver unless one of the restrictions applies. Why would the driver’s handbook tell you how to make a U-Turn if it were illegal? With the law on his side, my friend went to court today. The officer obviously realized he was wrong because he asked to have the case dropped before my friend even had the opportunity to enter a plea. Remember this the next time you hear someone say that “U-Turns are illegal in Ohio,” because it’s simply not the case. NOTE: I am not a lawyer and my knowledge of the law extends no further than reading the parts of the code and handbook I have quoted above. Basically, if you get a ticket, it’s not my fault. 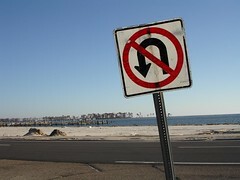 Also, local municipalities may have their own restrictions on U-Turns.